So I sent some time truing up my jointer tables. I then snug down all the lockscrews on the gibs. Went I change the table heights after, they go right back to their droopy positions. HELP! Do the gibs screws ever need replacing? I doubt the gib screws play any part in the problem. Need to make sure it’s coplanar right after tightening screws. Or in the condition you would use the machine in. Not all joints can be adjusted.Jointers with Dt ways can be shimmed if they have been mishandled or left the factory in poor condition. But this might limit your ability to adjust the table up and down. There is a small chance you might be able to clean crud that built up from a previous owners use.To do this you will have to take the tables off. Hopefully it’s a machine worth the trouble. 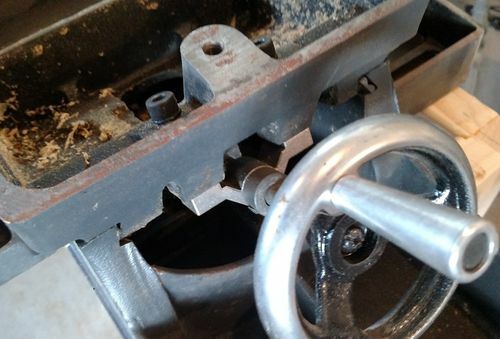 Not sure of the kind of jointer you have but first you should never have to replace the gib screws. If for some reason the gib screw are coming loose during operation (which they shouldn’t) back them out, clean them and add a 1/2 drop of Loctite 243 (Medium). Way adjustment is accomplished (though I think you’ve done this) by loosening the gib screws and the locking screws. Back them of by a full turn and wiggle the table. Screw them back down hand snug which should take out the play in the table way. If not then apply a 1/4 turn and try again. Table should move freely up and down the way but not side to side. Tweak the gib screw until there is no side to side. If that doesn’t work look at the clamp or bracket holding the table hand wheel in place (or maybe start here?). These are fragile (machined castings) and during moves most folks grab the I/O tables and lift. It puts a lot of stress on the bracket and they fail when they do fail the table will droop. Pic is from a 1994 Craftsman 6” I just finished rebuilding. It is the same as the Rigid 6000 series and almost every other 6” jointer built since 1985. Most 8” look the same but bigger.